Over the years I've noticed the color of cookware can have a profound impact on the food. When baking, dark cookware darkens food more while bright aluminum sheets make it tough to darken the bottoms of cookies. Makes sense; absorbs more heat and transfers it to your food. I guess that's why my orange terra cotta tiles in the oven are so perfect for pizza. Browns the bottom at just the right rate so the top can brown at about the same rate. When it comes to baking in a pan though, I prefer darker cookware. Cast iron is a favorite of mine but sometimes I just prefer something lighter. My second favorite bakeware is enamel on steel. The speckled stuff. Sturdy, cheap, perfect for roasting roots. This meal, inspired by my Mom (who does this in clear glass most of the time, my least favorite bakeware) is the best. Everything gets a nice crust to it and cooks evenly. AND, it takes about 30 seconds to prep and about 40 minutes to bake (while I play with the kid). 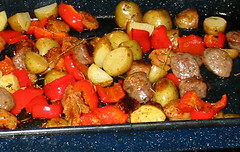 With that ramble in context: I chop frozen italian sausages, peppers and potatoes into about the same size cube (bit size), toss them into my enamel on steel pan, drizzle olive oil over it all, salt, pepper and rosemary, shake to distribute the oil and spices and bake at 400-deg-F for about 35-40 minutes. You can use any vegetable medley you please and it's a simple complete meal (as long as you're not a vegetarian).